I’m guest posting today over at Craftstorming for the 12 days of Christmas sewing series. Laura and Suz (of Sewpony) have gotten a great group of sewing bloggers together to talk about Christmas traditions and favorite memories… and of course some holiday sewing for the kiddos. 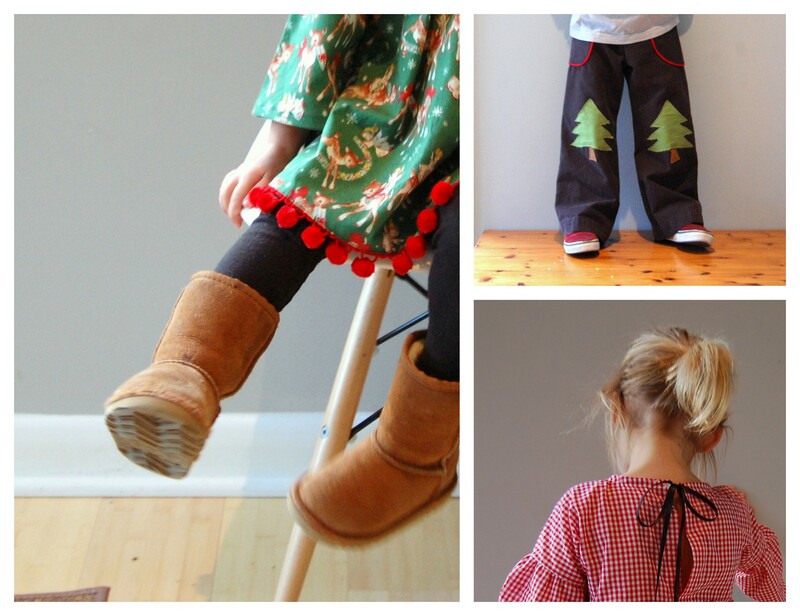 Hop on over to Craftstorming check out my crew decked out in their ‘Christmas Casual’ duds! Oh, and Grant has a message for you about fruitcake. I just HAD to tell you that these tree pants are SO adorable!! One of the cutest creations I’ve ever seen-what a great job! i loved your creations so much – all of them. wow, the pom-poms were the perfect touch. they were all so great! The ventriloquist doll Lester! Haaaaa! I remember! 😉 Love these adorable outfits. We are rocking bell sleeves on tunic tops a lot these days too! Wasn’t Lester cool? Why can’t I find toys like that these days?? Haha I grew up in Nj and can I just say holy cow Entemann’s is soooo good!! The rest of the world doesn’t know what it is missing!! I haven’t bothered making fancy holiday attire either, our tradition is to stay in pajamas all day long 🙂 I love your cute casual attire! I absolutely adore those pants! Like really really adore! Oooo, pom-pom trim, gingham and Christmas tree patches… I’m going to read more right now!